Enjoy the climate all year around with a furnace and air conditioning rental in Barrie, Innisfil, New Tecumseth, Wasaga Beach, Collingwood, Georgina, Orillia, Aurora, Newmarket, East Gwillimbury, and the surrounding area!! For some, a brand new high efficiency heating and cooling system can feel out of reach. Even though the cost of living in Barrie is 2.9 per cent lower than the national average, many residents will still struggle to come up with the thousands of dollars it costs to replace their heating and cooling systems. Luckily, there is now a new answer available for homeowners: a high efficiency furnace or central air conditioning rental. When you start to look at the advantages of renting versus a traditional financing of your new system, you may wonder why any property owner would choose not to rent. See a full comparison of renting vs buying here. Business owners who choose the rent their systems are able to take advantage of lower energy bills while keeping their work space comfortable for all employees. In addition, by having a fixed monthly cost, budgets are able to be more predictable and easier to stick to. In addition, with the advantages that come with the rental agreement, businesses are able to address any issues quickly and efficiently, losing less of their valuable man hours. With our coverage, any issues that come up are covered, so they can be easily addressed by a simple phone call by an office manager, rather than the CEO. Property owners also enjoy the benefits of a fixed monthly cost. Rather than scrambling to find the money to fix issues as they arise, landlords are able to build the cost of the service into their rent. In turn, renters are able to enjoy lower energy bills and homes with even and efficient heating and cooling. Renting is not just for commercial and rental properties, residential home owners are also able to enjoy the advantages of a high efficiency rental. Not only are they able to take advantage of the fixed monthly cost but they also have the advantage of an increase in property value. 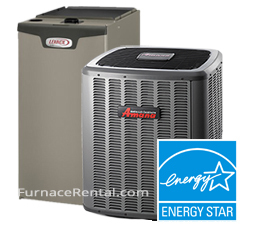 A high efficiency furnace and central air conditioner are an investment in the home. By upgrading these systems, homeowners are able to take advantage of lower energy bills, an increase in property value, as well as any available government energy rebates. If you choose to sell your home, the agreement can easily be transferred to the new owners so they can also enjoy all the benefits of the rental agreement. When it comes to servicing your new systems, gone are the days of wasting hours on the phone calling for quotes and referrals to find a reputable and affordable HVAC companies. Instead, rental clients are provided an emergency number that is available 24 hours a day, seven days a week to keep you warm all winter and cool all summer. By calling the emergency line, you are scheduled for expedited service. In other words, you get put in the front of the line. Not only are your service calls expedited, they are also absolutely free. That’s right, if anything goes wrong with your heating or cooling system it will be prepared for free and if it can’t be repaired it will be replaced, at absolutely no cost to you. We’re proud to serve the local home owners and businesses! Barrie is mostly located in the Enbridge service area, which means we offer natural gas rentals, as well as high-efficiency propane furnace rentals for home owners in more rural parts of the region. Mixing the convenience of a big city with the recreation and heritage of a small town, Barrie is an ideal place to vacation and call home. Located on Lake Simcoe, Barrie offers several waterfront areas to suit many different activities and interests. As part of the Trent Severn Waterway, Barrie offers two public boat launches as well as transient docking. For the avid cyclist, there are over 6 kilometers of paved waterfront trail to explore and enjoy. Centennial Beach features a children’s playground, volleyball courts and a large sandy beach. Restaurants are just a short walk away so you can really make it a fun day out. If you want a quieter beach experience, you can check out Minet Point Beach or Johnson’s Beach. Generally lifeguards are on duty from 11 a.m. to 5 p.m. from June until August except on rainy days. Situated on a natural snow belt, Barrie offers an array of outdoor winter activities. With an average of 100 inches of snowfall each year many locals and tourists enjoy the many opportunities for skating, skiing, snowshoeing and sleigh rides. After enjoying the winter wonderland, Barrie residents are able to enjoy a comfortable home all year round thanks to our furnace and air conditioning rentals.